Midterms Matter, and the general election is right around the corner! 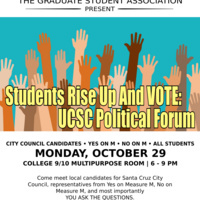 Come on out to listen to Candidates for Santa Cruz City Council as well as representatives from both the "Yes on M", and "No on M" campaigns, about why YOUR VOTE MATTERS. Candidates and representatives will give a short introduction, followed by a question/answer forum with students. Refreshments and snacks will also be provided!